In analogue to bicuspid aortic valves, bileaflet mechanical heart valves (BMHV) implanted in aortic position may influence blood flow and wall shear stress (WSS) patterns in the ascending aorta, potentially inducing aortic wall degradation and subsequent aortic dilatation. 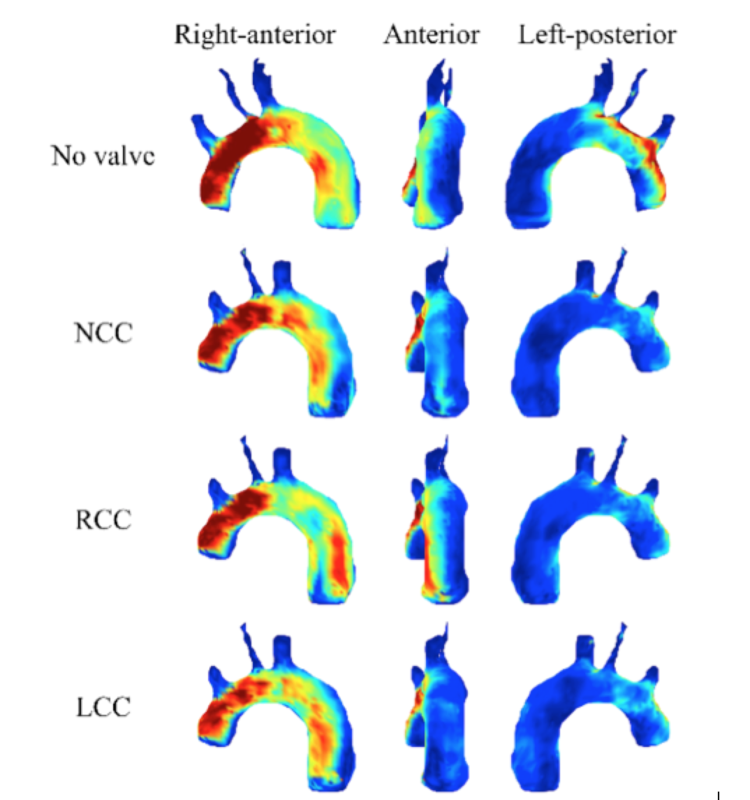 We investigate the effect of aortic BMHV orientation on ascending aortic hemodynamics using a 4D flow magnetic resonance imaging (MRI) compatible aortic phantom. A rotatable BMHV was implanted in an MRI-compatible aortic phantom with a pulsatile flow pump. 4D-flow MRI scans were made at 3.0 Tesla without a valve prosthesis and with a BMHV in three anatomical positions (perpendicular to each native valve leaflet) and blood flow velocity and WSS patterns were compared. Systolic forward flow volumes and heart rates were comparable in all scans. Regurgitation fractions were comparable in all BMHV scans. Peak velocity and WSS values were comparable between all BMHV orientations. At the level of the aortic root, peak systolic jet directions differed significantly between various BMHV orientations, resulting in different locations of peak WSS in the ascending aorta (figure 1). This study demonstrates that BMHV orientation determines the direction of peak systolic blood flow jet in the ascending aorta. Consequently, BMHV orientation influences ascending aortic WSS distribution patterns.